The 6400XT includes many feature improvements present in the smaller 3400XT, introduced last year. The infeed bed is 24 in. (60.96 cm) longer than previous Morbark grinders in the 1,000-plus horsepower range and has sloped sides. 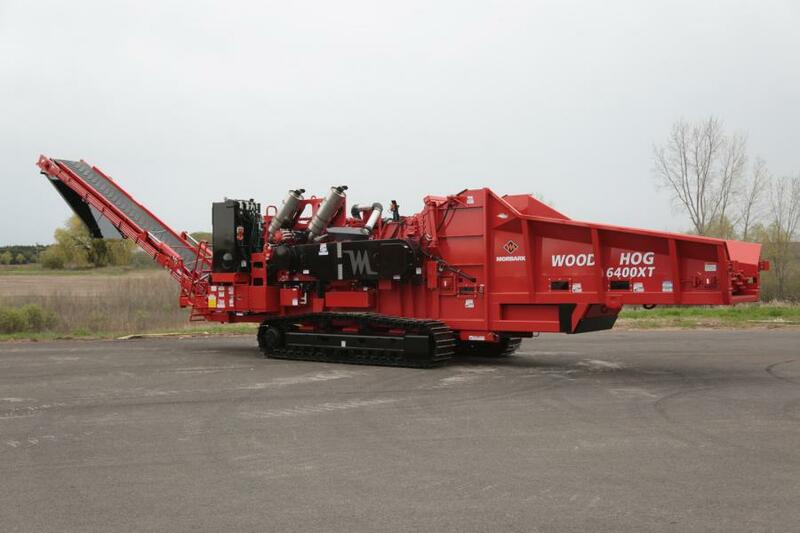 Morbark LLC, a manufacturer of forestry, biomass, tree care, sawmill and wood recycling equipment, debuted two new machines at this year's Expo Richmond show: the 6400XT wood hog horizontal grinder and the 50/48X whole tree drum chipper. The 6400XT includes many feature improvements present in the smaller 3400XT, introduced last year. The infeed bed is 24 in. (60.96 cm) longer than previous Morbark grinders in the 1,000-plus horsepower range and has sloped sides. This configuration improves operator sight lines for more efficient loading of material, according to the manufacturer. 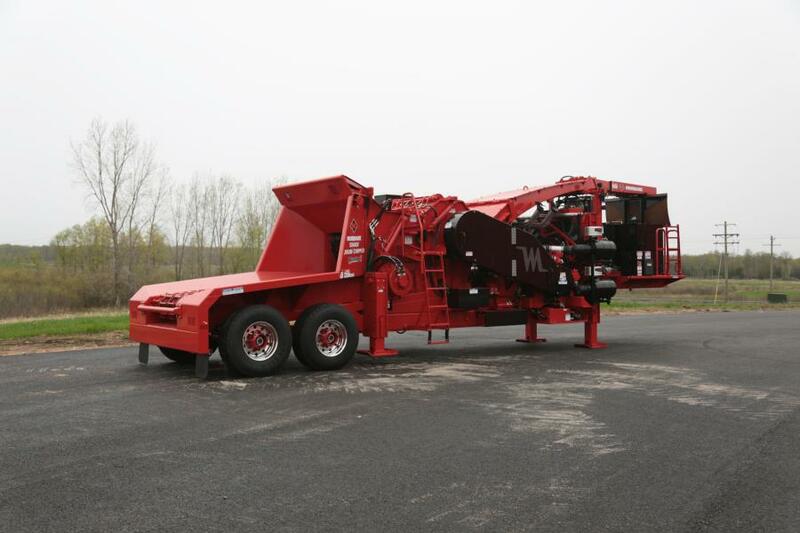 Standard on the 6400XT is a removable infeed chain return floor, which allows excess material to fall away to minimize the wear on the floor, bed chain and inserts, particularly useful in land-clearing or other applications with dirty material. Also similar to the 3400XT is the focus on transportability. The 6400XT weighs in at less than 96,500 lb. (43,772 kg) and measures 11 ft. 5 1⁄2 in. (3.49 m) wide with the standard Caterpillar 325L undercarriage with 600 mm double grousers, allowing the unit to be transported to nearly all domestic and international markets. The larger feedwheel (40 in. [101.6 cm] diameter, an increase of more than 15 percent), which raises 17 in. (43.2 cm) above the current 4600XL yoke and 11 in. (27.9 cm) above the 6600 yoke to allow better access to the hammermill during insert inspection. Another key improvement is the 42 by 61 in. (107 by 155 cm) solid-plate rotor with 3 in. (7.6 cm) retaining rods and a 42 in. (106.7 cm) tip swing. The standard hammer pattern is 18 hammers with 18 rakers, but like all Morbark rotors, it can be configured to multiple patterns for various application requirements. The standard engine options for the 6400XT are the Caterpillar C27, 1,050-hp (783 kW) engine or Caterpillar C32, 1200-hp (895 kW) engine, both Tier IV Final. Morbark's driveline protection system is standard on all wood hog models. The externally adjustable, break-away torque limiter helps to protect the driveline and hammermill from catastrophic damage caused by contaminants. “The most productive portable drum chipper in the industry has become even better,” said Stanton. The 50/48X was updated to a similar design layout as Morbark's other industrial drum chippers with a sloped infeed, reverse-pivot top feed wheel, bottom feedwheel, externally adjustable anvil and Advantage 3 drum assembly that can come as 10-knives for fuel chip or 20-knives for micro-chip applications. Other improvements focused on performance and production. The powerful top feedwheel was enlarged more than 15 percent to 40 in. (101.6 cm), and the enhanced hydraulic system now includes a direct drive Poclain motor for the top and bottom feedwheel that eliminates previous chain and sprocket drives and provides more torque. The 50/48X can be equipped with a Caterpillar C27, 1,050-hp (783 kW) engine or Caterpillar C32, 1200-hp (895 kW) engine, both Tier IV Final. The PT Tech HPTO15 hydraulic clutch is now standard, which allows flexibility across a wide range of chip sizes. “The Morbark 50/48 has long been the industry standard for high-production mobile fuel and micro-chip applications, and we strongly feel these improvements will minimize downtime, increase production and provide overall customer success,” said Stanton.